A bundle of cellulose fibers around 253 million years old, as seen under a scanning electron microscope. The plant-like material was recovered from a salt deposit 2,000 feet beneath the ground in New Mexico. If Martian life existed a few billion years ago, scientists think any plant-like microbes would have left behind a stringy fuzz of fibers. That'sbecause here on Earth, researchers now say they have found such ancient fuzz,called cellulose, preserved in chunks of salt deposited more than 250million years ago ? making it the oldest biological substance yet recovered.The announcement comes about a week after a team of planetary scientistsannounced discovering evaporated saltdeposits on Mars and adds another element of hope to the search foralien life or signs of its past biology. In fact,microscopic cellulose fibers might be one of the best signatures of any pastlife on the red planet, said Jack Griffith, a microbiologist at the University of North Carolina at Chapel Hill. "Thesefibers are the oldest native, intact remnants of a living thing ever directlyobserved," Griffith told SPACE.com. "It's extremely fortuitoustiming, as we've just discovered salt deposits on Mars' surface." PhilChristensen, a planetary geologist at Arizona State University who helpedidentify the Martian salt deposits and was not involved in Griffith's work,said the new fuzz finding piques his interest. "Ifthe organic evidence of life's existence disappears at a site, it's hard to becertain anything was there," Christensen said. "I think findingcellulose in salt deposits on Earth makes an even stronger case for searchingfor life in Mars' salt deposits." Griffithand his colleagues detail their salty cellulose discovery in the April issue ofthe journal Astrobiology. Until theteam's discovery, protein recovered from a 68 million-year-old Tyrannosaurusrex fossil owned the oldest-known biological material. 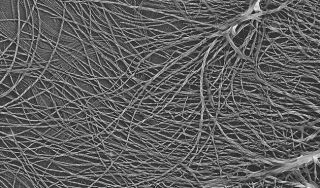 The253-million-year-old cellulose fibers Griffith and others found are essentiallythe same stringy molecules that give wood its toughness. ?Celluloseis like the bacteria?s house, the biofilm surrounding them," Griffith said. "Plants adopted cellulose as their structural entity." Heexplained that the samples found survived not only because of theirexceptional sturdiness, but also due to the salty environment: it killed offbacteria, preventing the cellulose from being chewed up as food. "Cellulosefibers are just strings of glucose sugar molecules stuck together, end onend," Griffith said. "You can dissolve glucose, but as cellulose itresists some of the harshest chemicals and conditions out there." He thinksthe micro fibers likely came from plant-like algae cells that thrived in a lakesimilar to Utah's Great Salt Lake. "Thealgae may have deposited this stuff as the lake evaporated," he said,entombing it until the scientists dug it out of the Salado Formation ? anancient salt bed in New Mexico and nuclear waste repository ? and analyzed itunder an electron microscope. "It's very eerie down there. You get a realsense of how old the place is." If a futureMars-boundrobotic explorer seeks out signs of ancient life, Griffith said looking forcellulose in salt deposits peppered south of the planet's equator would be thebest places to start. "Cellulosewas one of the earliest polymers organisms made during their evolution, so itpops out as the most likely thing you'd find on Mars, if you found anything atall," Griffith said. "Looking for it in salt deposits is probablya very good way to go." Christensensaid Martian salt deposits likely formed after briny pools of water on theplanet's surface ? a sun-bathed environment for photo-synthesizing organismsthat may have made cellulose. "Thesun is an awfully nice source of energy to turn down in your evolution as amicrobe," Christensen said. "If we do find signs of life on Mars, Iwouldn't be at all surprised if it is plant-like in nature." MalcolmBrown Jr., a molecular biologist at University of Texas at Austin who hasstudied cellulose for decades, affirmed that such molecules could survive the test of time within salt. "Ihave no doubt in my mind that it's possible, even after 3 billion years," Brown said, "just aslong as excessive heat or pressure didn't destroy the evidence."